Although Charles McDevitt's skiffle group had only a short time at the top, they were responsible for a skiffle classic that must rate with Donegan's 'Rock Island Line' as one of the greatest anthems of the era. Perhaps there was something in its air that nurtured skifflers, but Donegan, McDevitt and Nancy Whiskey were all from Glasgow. Undoubtedly, the McDevitt Skiffle Group, together with Lonnie Donegan and the Vipers dominated the UK skiffle scene during the mid to late 1950s. Charles McDevitt was a skilled banjo player who had found work with Ken Colyer's former project, the 'Crane River Jazzband'. Ken Colyer's influence on the British popular music of that time should not be underestimated. During the early part of that decade his unit had been host to Chris Barber, Monty Sunshine, Lonnie Donegan, Beryl Bryden and Johnny Parker- who later joined Humphrey Lyttelton and was the pianist featured on 'Bad Penny Blues'. However, it was not long before Chas had formed his own group and was playing gigs wherever people could be encouraged to gather and listen. The venues included many of the burgeoning London coffee bars of the time- the best known of which was the 2 'I's in Soho- and dance halls as far out as the Ritz in Kingsbury. Anne Wilson played the guitar and sang folk music in the Glasgow area. One of the Scottish folk songs that she sang was 'The Calton Weaver', and featured the line "whiskey whiskey, Nancy-o". As a consequence, "Nancy Whiskey" became her adopted name. At about the same time that McDevitt was already beginning to progress in skiffle, Nancy and her boyfriend- amateur musician Bob Kelly- decided to try their luck as folk musicians in London and made the move south. "Freight Train"- an American folk song attributed to Elizabeth Cotton- was already an important part of Charles McDevitt's repertoire when Nancy Whiskey arrived. However, Miss Whiskey's vocal rendition proved to be a magic ingredient and the song soon found itself being played everywhere. The EP on the left 'Nancy & Chas.' EP-7002 contains all the songs from the pair's most successful two singles. These were among the biggest sellers that appeared on the Oriole label. Oriole were a small company and independent from the relative giants of EMI, Decca or Philips. 'Freight Train' thus became a hit on both sides of the Atlantic and allowed Whiskey and McDevitt to find work in the US as well as Britain. They did so both together and as individuals- the partnership not surviving very long. The McDevitt group went on to record with other female vocalists, notably with Shirley Douglas. Nancy Whiskey formed her own backing group and had to survive a press scandal when it was discovered that she had started a family despite the fact that her partner- both musically and at home, Bob Kelly- was still encumbered with a previous marriage. Nevertheless, both she and Charles McDevitt managed to carve out modest musical careers mainly on the strength of 'Freight Train'. Unfortunately, neither managed to produce anything else as memorable or original. 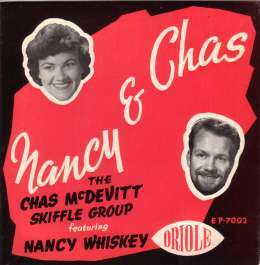 At the time of writing Charles McDevitt could still be found playing "Freight Train" occasionally, but sadly Nancy Whiskey died on February 1st, 2003. If you would like to know more about skiffle music then I can recommend no better book than Chas McDevitt's own fascinating inside story on the subject 'Skiffle' (ISBN 1-86105-140-9) published by Robson Books Ltd, Bolsover House, 5-6 Clipstone Street, London W1P 8LE [Price £19.95]. Note: Nancy Whiskey was featured on CB1352, CB1371, CB1386, CB1403. Oriole EP7002 1957 "Nancy And Chas"